These challenge coins are stunning. Designed and initially sold through Facebook by Tim Trend, the coins honor the DLG/CG 31. Made of brass, each coin is approximately 1.75”. 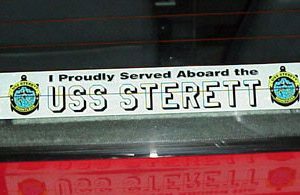 The front contains the ship’s crest while the reverse contains the impressive silhouette, identifies the owner as a proud Sterett crewmember and displays the ship’s service years. 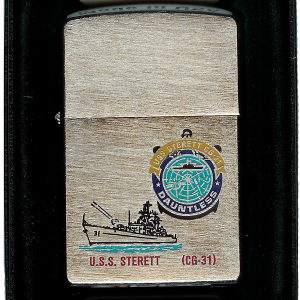 The Sterett challenge coins are only available through the Sterett Association ship’s store and are limited in quantity. These beautiful challenge coins are $11.00 each, includes shipping. 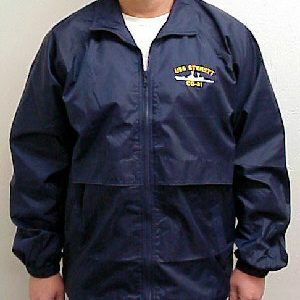 3 or more coins are $10.00 each, includes shipping.